In this space wallpaper, an artist's concept shows the closest known planetary system to our own--Epsilon Eridani. Observations from NASA's Spitzer Space Telescope show that the system hosts two asteroid belts, in addition to previously identified candidate planets and an outer comet ring. Epsilon Eridani is located about 10 light-years away in the constellation Eridanus and is visible in the night skies with the naked eye. 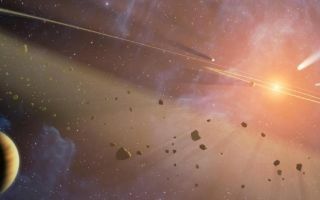 Astronomers think that each of Epsilon Eridani's asteroid belts could have a planet orbiting just outside it, shepherding its rocky debris into a ring in the same way that Jupiter helps keep our asteroid belt confined. The planet near the inner belt was previously identified in 2000 via the radial velocity, or "star wobble," technique, while the planet near the outer belt was inferred when Spitzer discovered the belt.